The Bose Connect app gives you quick access to all the necessary functions which enable using the headset to the fullest. Apart from convenient playback settings, the app has one more useful option - an earbuds search. The noise cancelling is not that good. The Bose SoundSport Free are well-designed earbuds that will become a great choice for active people. The set is water- and sweat-proof, and thanks to the StayHear+ Sport tips, the earbuds will comfortably sit in your ears. The 4-mic system and the acoustic chamber shape dampen the outside noise, including the wind noise. You can use Alexa, Siri, or Google Assistant with these totally wireless earbuds. The Jabra Sound+ app adds to the functionality greatly. The buttons are a bit stiff. The Jabra Elite Active earbuds are a great option for those into sports. The buds sit tightly in your ears and are protected from dust and sweat. The latest Bluetooth 5.0 offers a range of benefits compared to older versions. The LED light on the body of the earbuds here is not only for decorative purposes. It also rings the touch button, which allows for more comfortable switching of the settings as well as volume control. May be hard to link them to your device for the first time. The LEIYER wireless sports earbuds will please you with a powerful and clear sound, small weight and ergonomic design. You also will be able to answer the call in the hands-free mode. It is an optimal solution for those who seek high functionality at an affordable price. To pair the earphones with your mobile phone, you won’t have to press any buttons whatsoever. 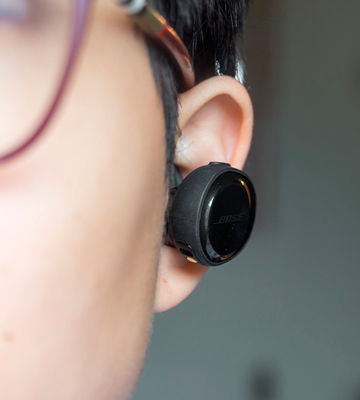 Using the Single Mode, you’ll be able to take a call or listen to music in one ear, while having your other ear free to listen to your surroundings. The battery doesn't last for a very long time. 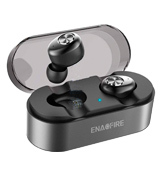 The ENACFIRE E18 serves as a great example of what cordless Bluetooth earphones have to be and what advantages they should offer. The sound quality here does not trail behind its wired counterparts, the ergonomics are on par, and the practicality is unrivalled. Easily the best earphones in their price range. 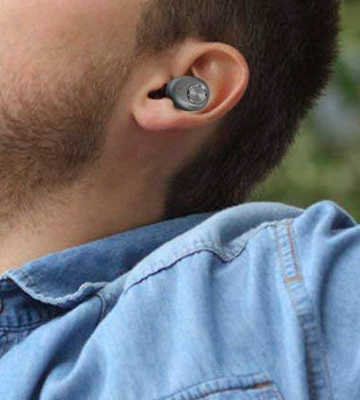 The Apple W1 chip ensures great wireless connectivity, making sure that the earbuds sound perfectly, work well with no interference, and consume battery charge sparsely. The scratches are visible on the casing. 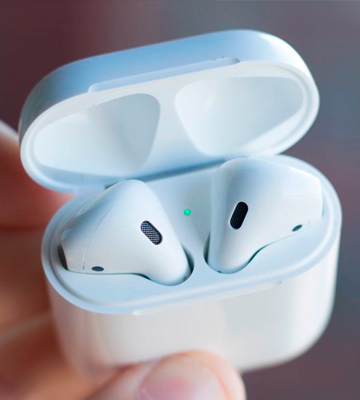 The AirPods are unique wireless earbuds that combine minimalistic design and convenient functions. They come ready to use and are well compatible with all Apple gadgets. Sensor controls, compatibility with Siri and built-in gauges are just a few of the advantages these earbuds can offer you. From the very moment when the famous AirPods from Apple appeared on the market, manufacturers of all kinds of gadgets were haunted by the idea to create their analogues. 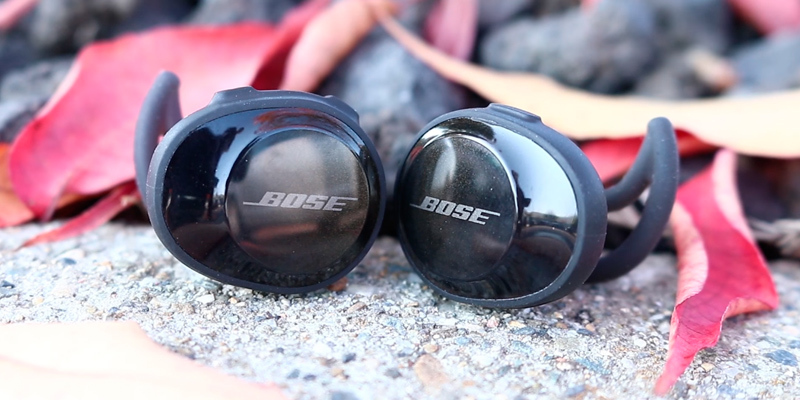 Though not all attempts were successful, some companies did succeed, and Bose SoundSport Free is a great example of that. Not only does these headphones not lose to the original version, they actually even win in some aspects. Let's see what these headphones offer. First things first, these headphones were designed specifically for those people who enjoy doing physical activities while listening to music. 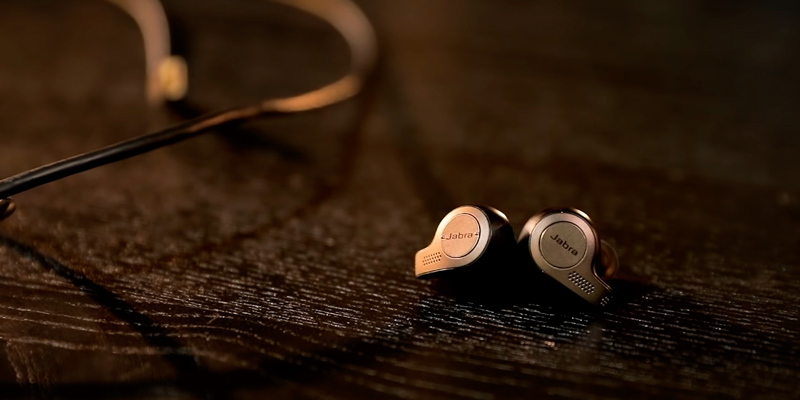 They feature a well-thought-out design and sit comfortably in the ears. Next, they are sturdily built and feature great sweat and water protection, so you can be sure they will survive even a vigorous workout. Also, the set includes special Sport tips - these tips keep the earbuds firmly secured in your ear channels and prevent their falling out during exercising. What we also like about these tips is that they effectively block the ambient noise, minimising distractions and providing you with more comfort. Design aside, Bose SoundSport Free sound great. They produce good bass and clear vocals. And though some people say that, if used without Sport tips, they may let some outside noises in, it's not to the point where you cannot enjoy music. Thanks to a great balance of bass and vocals, you're guaranteed to enjoy the power of music in all its beauty. The next advantage of Bose SoundSport Free is long working time. These headphones can work for up to 5 hours on full charge at a medium volume and up to 10 hours with a charging case. It's worth pointing out that the case here is not as small as that of the original AirPods, but it's still compact enough to comfortably carry it and use on the go. Despite these headphones are bigger than the majority of wireless models, it is still quite easy to lose them if they are not stored in the case. That said, it's not like you won't face the same kind of problem with any other wireless headphones. Being small and with no cords, they often tend to get lost in the cluster of other things. 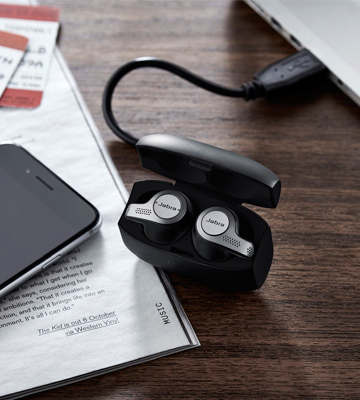 Luckily, the manufacturer of these headphones has thought of a smart solution - instead of ploughing through the whole contents of your bag, you can download the Bose Connect app and activate an earbuds search, a function that will help detect where your headphones are. Besides this function, you'll be able to access many other settings enabling you to customise your listening experience from your smartphone. Plus, with this app, pairing the headphones with your smartphone is much easier. You can adjust the headphones using the controls as well. Placed on the body of the buds, it is convenient to push them with your fingernail. Using these buttons, you can turn the volume up/down, skip tracks, or answer calls without taking your phone out of the pocket. This isn't something new and many headphones have these buttons, but we find it important you know all in detail. To conclude, if you aren't particularly bothered about buying the original AirPods or you don't have an iPhone and simply look for high-quality wireless headphones to take with you to the gym, Bose SoundSport Free model can be your best fit. Compatible with a wide variety of devices, it will provide you with freedom of movement and the quality of sound that you're sure to love a lot. The Jabra 65t is a premium model, so if you are looking for the best true wireless earbuds, this is your stop. 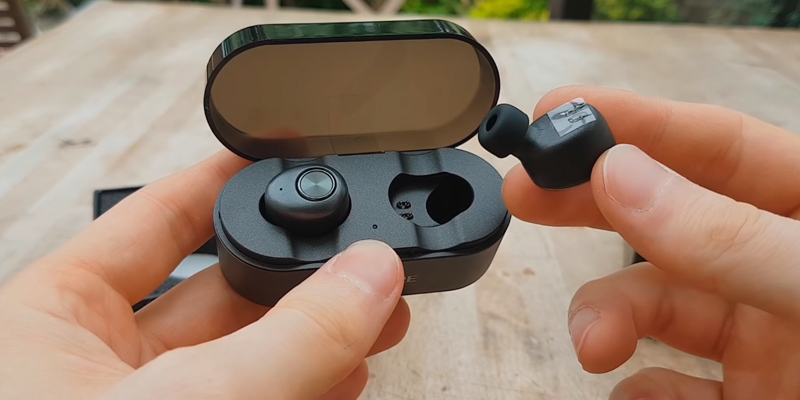 They basically have everything: a number of gels to fit any ear, IP56 protection against sweat, rain, and dust, Bluetooth 5.0 for the best connectivity and high quality of sound. When you make a call, it is often essential to have your opponent hear you loud and clear, and not every phone, let alone headset, is able to provide that. Well, the Jabra 65t is great when it comes to this. Thanks to a special system where the set uses a 4-microphone technology, your speech will be well-heard on the other side. The quality of the sound you hear is also good thanks to the special chamber shape that dampens all the outside noise, including wind noise. It wouldn't be as premium as it is if there weren't extras, of course. The Jabra 65t buds work with any phones, be it Android or iPhone, as well as other music devices equipped with Bluetooth, and they can connect to your voice assistants—Alexa, Siri, or Google Assistant. Now you can give commands without stepping off your treadmill. Moreover, as a special feature for active people, these smallest no-wire earbuds have a motion sensor embedded, making it possible to track your activity when you work out or just walk around. The portable charging case of the Jabra 65t is not the smallest one you can find, yet it is still ergonomic and sleek. 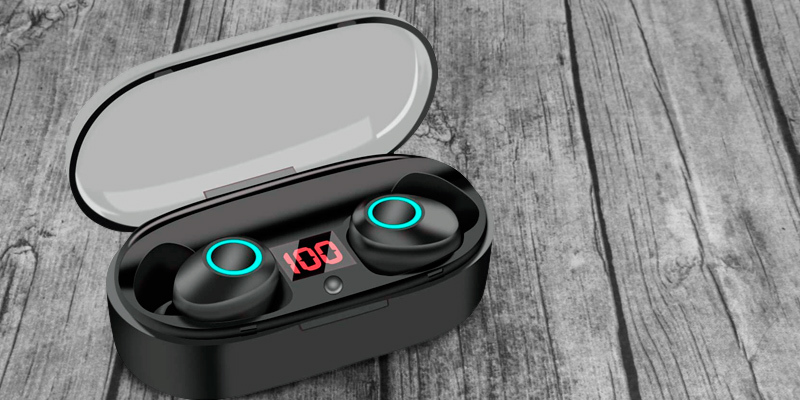 The one full charge of these true wireless earphones last for 5 hours and the case can provide you with two more charges. This pair of earbuds is pretty energy efficient. It features an auto power-off function to save the charge. Plus, the auto pause feature stops the track when you take one earbud out and turns it on when you put it back in. This option is especially convenient since the control buttons on the body are a bit stiff and hard to push. The set of the Jabra 65t features 3 pairs of black silicone tips to fit any ear. 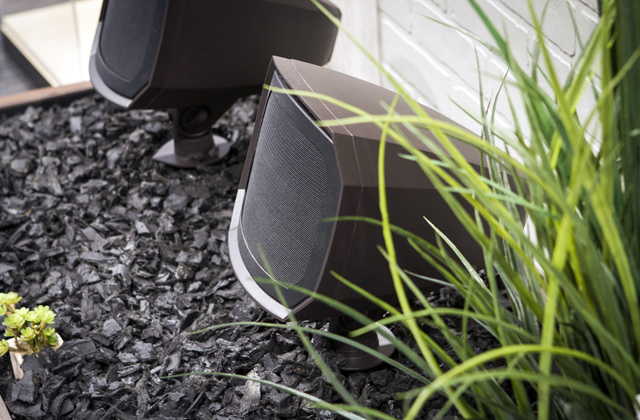 The speakers come in a titanium black colour, which looks nice and can’t be soiled easily. Also, the nice addition is the Sound+ app. 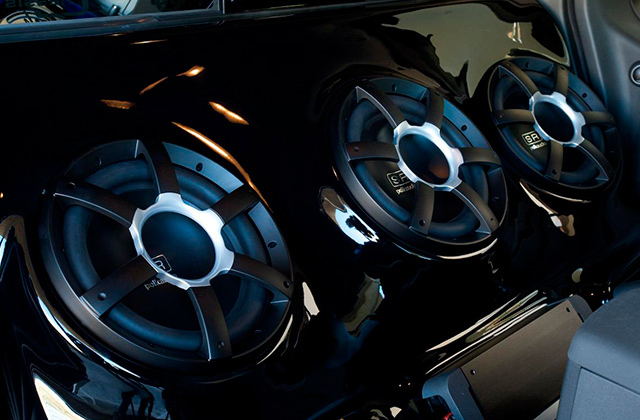 It gives you access to an equalizer that allows for customizing the sound the way you want. So, the Jabra 65t is a pair of high-quality true wireless earbuds that will please their owner with long autonomous work and good sound. They can be connected to any phone and work with voice assistants, which makes these earphones a worthy buy. The LEIYER EB888 is a pair of True wireless earbuds that boast cool design, great sound quality, and good price. No doubt, these earbuds look really great. With a stylish LED light on the body they attract attention immediately. However, this light serves not only as a decoration element here. It also allows for a better control of the settings. Speaking of which, it's very easy to adjust them and all is done with the help of a single button requiring just a few clicks. The LEIYER EB888 is available in three colours - black, blue and red - so it can highlight your personal style. The charging case comes in a matching colour. The cap of the earbuds is transparent, which is nice, and they have an indicator showing you how much the battery charge's left. The working time from one charge makes around 4 hours and, if used with a charging case which can give you 3 extra charges, you get 10 hours in total. Of course, the LEIYER EB88 can be used not only for listening to music but also for answering calls. They are fitted with a microphone and a switch so you can answer/decline your calls without removing your phone from the pocket. The sound produced is rather clear and crisp. Users rate it very high and say you can hear the instrumentation in each track. The bass is weaker though, but we still find it more than sufficient. The completely wireless design makes this headset suitable for fitness lovers as well. Thanks to the variety of tips supplied, these in-ear headphones will securely fit your ear. The Bluetooth 5.0 gives you a quick and quality connection with your mobile device in a range of 10 meters, letting you go with your workout and enjoy the freedom of movement. Pairing the phone with the buds is not complex, though some people say the first time they did it the buds couldn't detect a phone, and they automatically re-connect when you're back in the range, which is very handy. The best thing is, while offering immaculate quality, great sound, easy pairing and such cute design, the LEIYER EB888 true wireless earbuds belong to mid-price range products, making then an attractive choice for a wide variety of people. All in all, if you're looking for a decent alternative to AirPods, the LEIYER EB888 True wireless earbuds can be the best choice. Available in several colours and with a matching charging case, this model is no less convenient or worse in quality. The buds are beautifully designed and come with different skins so they fit your ears perfectly letting you stay active and confident whatever you do. Plus, the charging case is much more lasting that it is in many similar analogues, which makes it a real steal for those who spend a lot of time on long travelling distances. You know what we like in our wireless earphones? No, not audio quality, although that’s a fair guess and you’re not wrong on that one. What we like most is simplicity. At the end of the day, isn’t it the biggest appeal of wireless technologies? 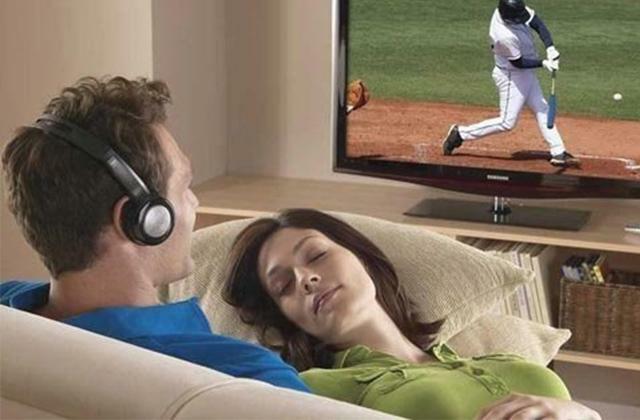 No cords, no wires, no hassle. With that idea in mind, let’s talk about the ENACFIRE E18. What we have here is a pair of earphones that has simplicity as the cornerstone of its design philosophy. To pair this pair (our deepest apologies) with your mobile phone, you won’t have to press any buttons whatsoever. Just pull them out of the charging case and the device automatically appears as a primary Bluetooth option in your smartphone’s Bluetooth menu. Speaking of the charging case, we really like how small it is. You can easily fit it inside your pocket. 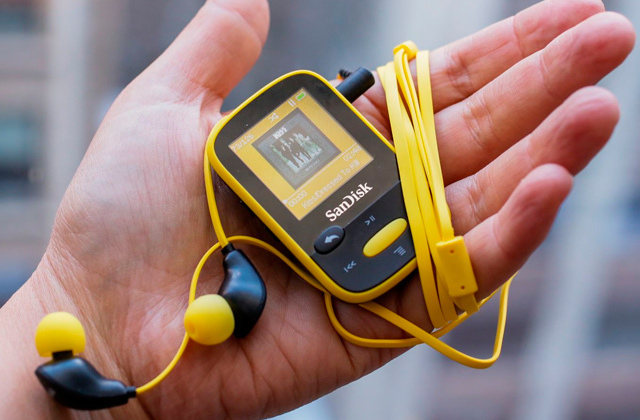 The headphones themselves deliver up to 4 hours of continuous playtime and the case will let you charge them 5 times over, so you’ll have 20 hours of music on the road. Ra's al Ghul in Batman Begins taught the titular character to always mind his surroundings. The people behind these earphones may not agree with the underlying theme of his philosophies but reckon this particular idea has its merits. That’s where the Single Mode comes in. Using this mode, you’ll be able to take a call or listen to music in one ear, while having your other ear free to listen to your surroundings, a particularly useful mode for riding and driving. Finally, for what is essentially a mid-range device with a price tag below 50 quid, the audio quality here is superb. 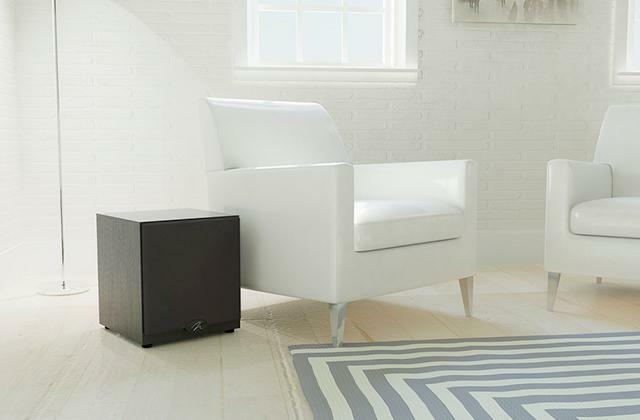 The bass is powerful and the HD stereo output is crisp and clear. The model is loud enough to block the background noise and the range of 33 feet (10 metres) is more than you need from a device like that. 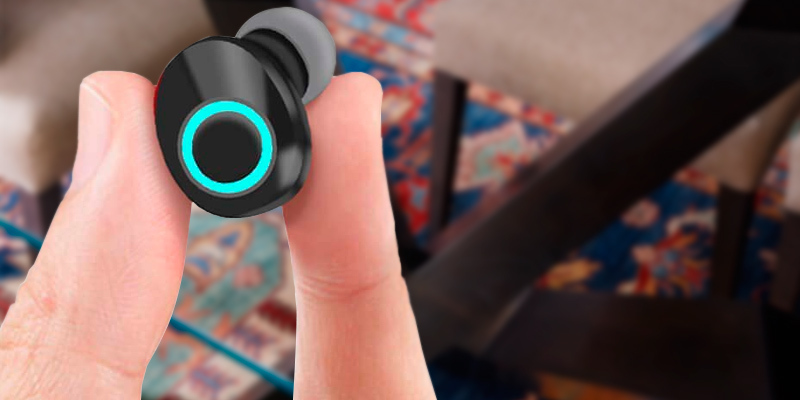 Thanks to that, you can share the earbuds with your family or friends and get the best experience together. And thanks to 3 silicone ear tips in large, medium and small sizes, the earbuds will fit anyone. 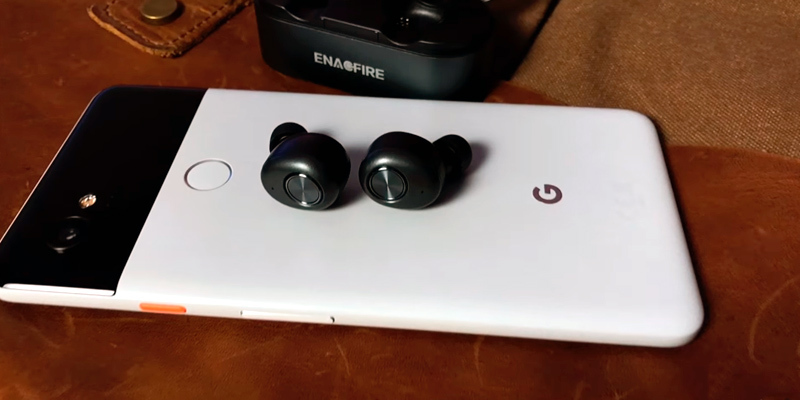 Long story short, the ENACFIRE E18 serves as a great example of what cordless Bluetooth earphones are all about and what are their biggest strengths and advantages. The sound quality here does not trail behind its wired counterparts, the ergonomics are excellent, and their practicality is practically unrivalled. All in all, these are arguably the best earphones in their class. 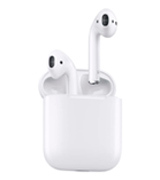 The ultra-lightweight modern Apple AirPods are fully wireless in-ear headphones that offer a reliable wireless connection, effortless pairing with Apple devices, high-quality audio and good call quality. The AirPods are the first completely wireless headphones from Apple. They win a top of the class in the in-ear headphone department. A specially designed W1 chip gives these AirPods amazing capabilities, allowing for their instant syncing with devices driven on iOS. The wireless connection is solid and reliable, and the sound is open and great. The headphones boast dual-microphone set-up and clever noise cancellation which uses special vibrations to sense whether you're speaking or not at the moment, and when you are, it automatically adjusts the playback so that you can use one or two headphones simultaneously. Thanks to this, the AirPods activate as soon as you put them in your ears and switch themselves off when you take them out. Those who love the original Apple products will definitely appreciate these Apple's wireless AirPods. 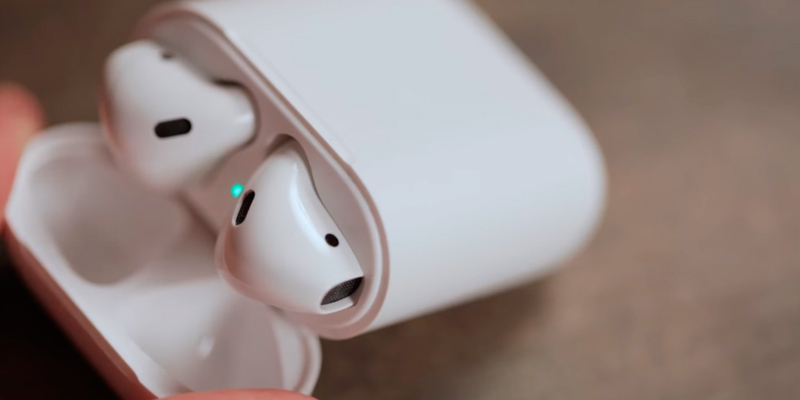 The Apple AirPods come with the charging case that not only allows for keeping them there neatly when travelling, for example, but is also meant for charging them when they run out of power. Per charge, the case enables up to 5-6 quick charges, providing you with up to 30 hours of listening time or 12 hours of talk time in total. That's the biggest edge over the competition. What Apple products stand out for are high-quality build and design, although most of their gadgets look very similar. 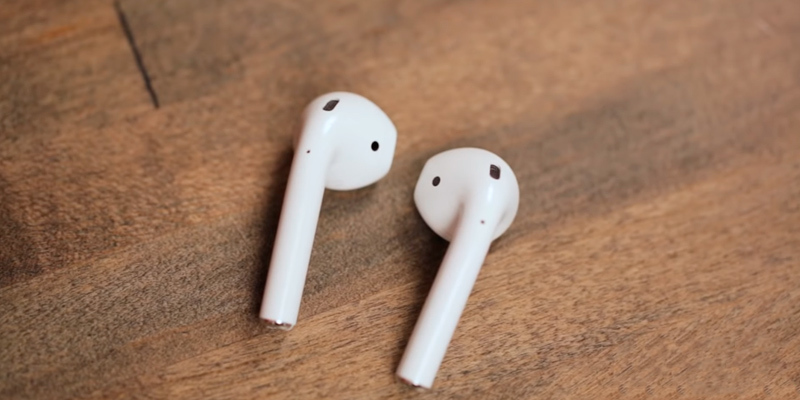 The Apple AirPods do not look essentially different from the EarPods, except they do not have wires. In other respects, they feel and look pretty much the same. Most customers find them extremely comfortable. They do not tend to fall off ears, in spite of their ear-in design, and they are well-suited for all kinds of activities. The charging case that comes with the AirPods makes it easy not only to charge the headphones on-the-go when they run out of power but also store them away in a neat manner. They are lightweight and small, and you will also be able to carry them in your pocket. Like all Apple gadgets, these AirPods are available in several colour options. Most of you would agree that for the price, you could find many other decent-quality wireless headphones and even get some better sound characteristics than those of these AirPods. 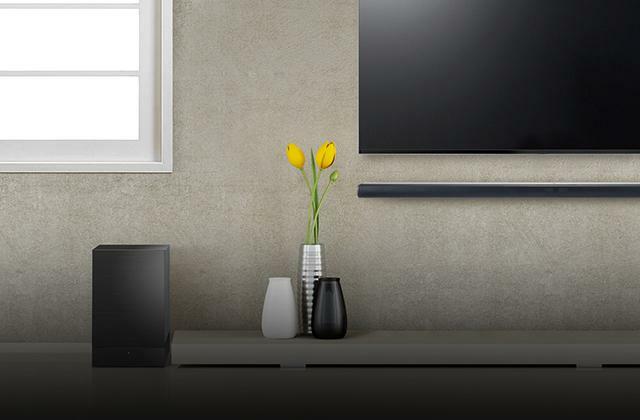 To some extent, you'll be right, since the market of audio products constantly evolves keeping presenting models that stun with their impressive technical specs. Yet, if you're a true fan of Apple products, it's very unlikely you'd turn your back to these. Though these AirPods might still need some improvements, their overall sound performance isn't bad at all. 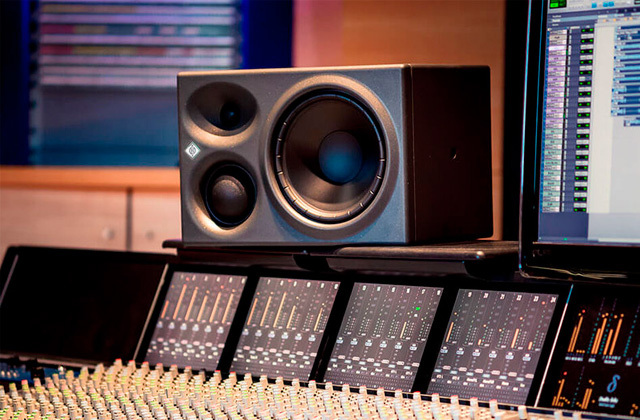 The vocals are clear, and the treble is rounded-off. The bass doesn't sound harsh nor does it overshadow the instrumental play or song. The headphones seal tightly to block outside noise and most users say they feel pretty comfortable in the ears. If you aren't a bass-head seeking deep bassy sound, you'll surely be more than satisfied with the performance of these AirPods. They boast a small charging case that is convenient to carry around and a unique design which not only looks good but also makes them comfortable to wear. 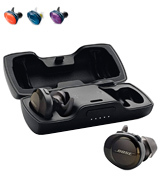 Now, you probably know wireless headphones and earbuds to be something that connects to your player or smartphone via Bluetooth and therefore has no wires to hang from your ears to your pocketed device. The earbuds still had a cord that connected the buds, though. That’s the extent of wireless we’ve known for some years already. True wireless earbuds are basically just two separate earbuds, there is no cord connecting them to each other. You just push them up your ear canals like your usual buds and go. Nothing slaps you on the back of your neck, nothing tangles in your hair. It’s utterly convenient. At the same time, besides enhanced convenience—no tangling wires, nothing getting in your way and hindering your movements—these more up-to-date earbuds offer better sound quality, and that’s something that was often a major issue with any wireless audio devices. 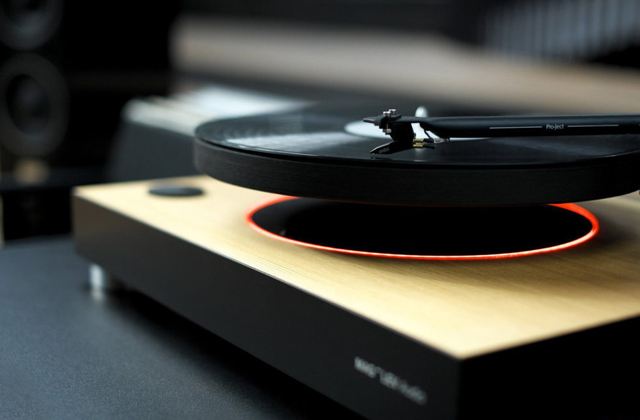 It is yet to reach the level of a good CD player, of course, but it is already better than what everybody has gotten used to. Basically, true wireless earbuds are a new step in portable audio technology where the pros overpower any cons for most users. Try them for yourself! 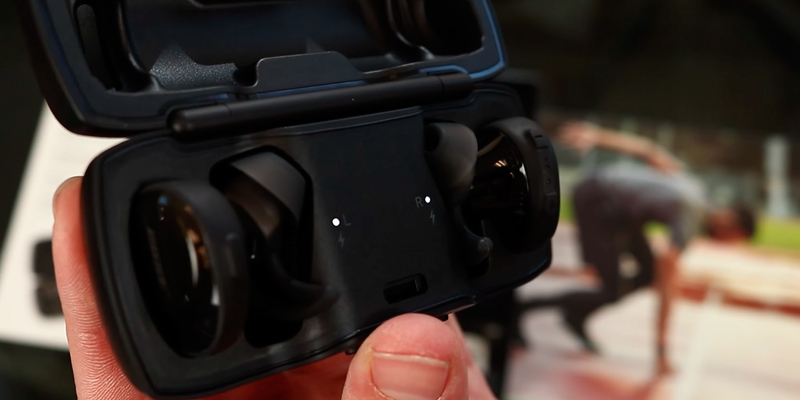 We‘ve already specified what the true wireless earbuds are, so let's discuss some key features you need to pay attention to when buying a set of wireless earphones. The main task of any earbuds or headsets was, is, and will always be to produce a high-quality sound. So, when choosing a pair, you need to look up to a frequency range. The numbers stated by the manufacturer reflect the capability of the earbuds to reproduce the sound. The hearing range of the human ear varies from 20 Hz to 20 kHz. Hence, the range of your earphones should be as close to this number as possible. The next important moment for all the music lovers is the amount of bass. In most models, it doesn't sound too harsh and doesn’t overshadow the instruments. 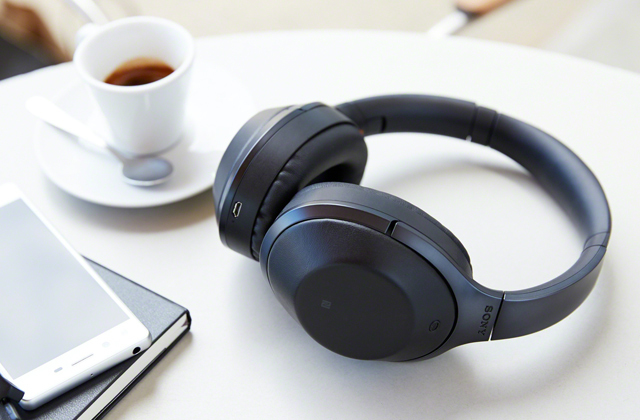 The next feature that also affects the quality is the noise cancellation. With the earbuds that can isolate the ambient noise, you will be able to listen to music and make phone calls even in the crowded places. 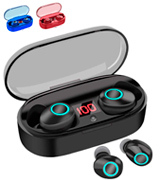 This type of earbuds is suitable not only for listening to music but also for making calls since these buds usually come fitted with a microphone. When choosing a pair of earbuds, you need to keep in mind that your listening sessions may last for a few hours. You may want to spend the road trip in a company of your favourite tracks or watch a 2-hour movie, that’s why your earbuds should sit as comfortably in your ears as possible. To avoid unpleasant sensations when you take them off, look for a pair that comes with various ear tips. If you plan to exercise in a gym listening to motivation music, there are some models on the market that were designed specifically for this purpose. 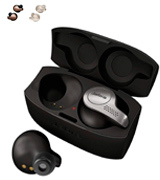 They include special Sport tips that can securely lock the earpieces so that you can have no worries about losing them. 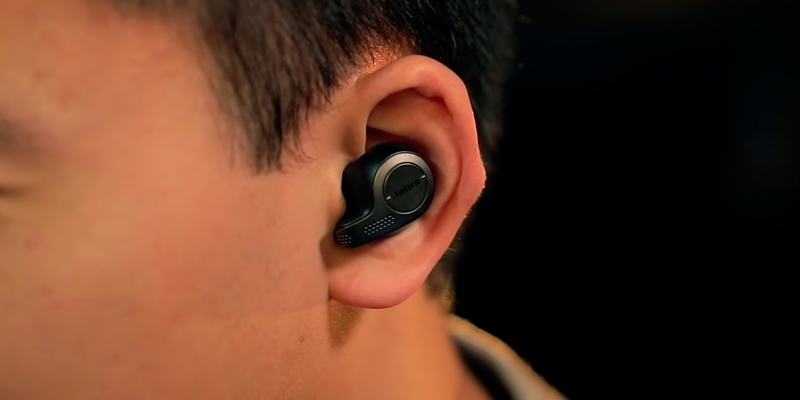 True wireless earbuds come fitted with Bluetooth for easy pairing with your phone. The better the version of Bluetooth your earphones are featured with, the less the chance of interference is. The average working range of wireless buds makes 9-10 meters. Some of them have an auto-connect function, and all you have to do is turn on Bluetooth on your phone and take the pieces out of the box. A few models work with special apps which you can be installed on your smartphone. 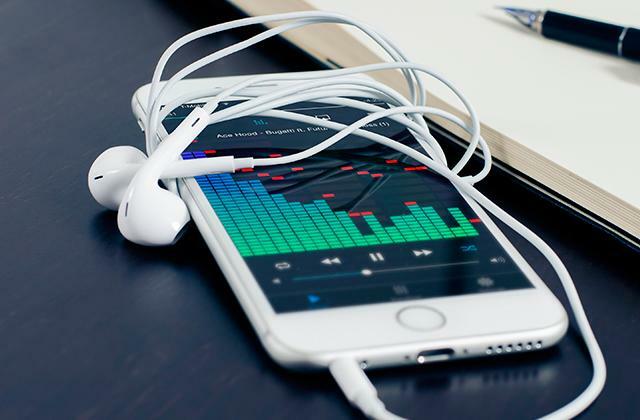 These apps also significantly simplify the connectivity and give you access to additional features like an equalizer or earpiece search. When wearing wireless earbuds, you can change tracks, control the volume, and take calls using your phone mainly. 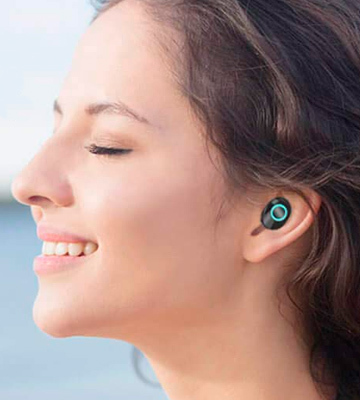 But some models come fitted with buttons allowing you to perform all those actions via earbuds. Lastly, the feature you need to compare when buying any sort of wireless stuff is battery life. Normally, the pair of earbuds works for 3 to 5 hours, depending on what volume you prefer. The portable charging case that also serves for storage can provide you with 1 to 3 charges. Headphones and earbuds became an integral part of our daily life. Today, when we leave our house, we usually take keys, a phone, a wallet and a pair of earphones. Earphones have been around longer than you probably thought. The first prototypes appeared in the 1880s. They have only one earpiece and were used by telephone operators. With such a rich history, a few myths have appeared. That’s why we decided to share and discuss the most popular of them. The thing is, they can actually bear an impressive amount of pressure before breakage. What really damages the headphones is the amount of electrical signal they receive. So, the loud sounds are not really the point. 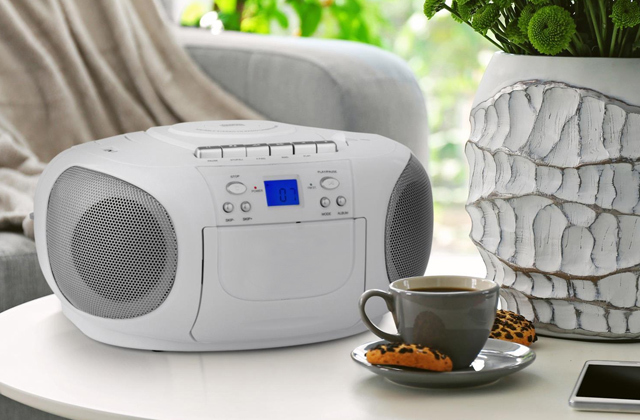 However, listening to music on the volume above 80 dB may have a negative effect on your hearing, that’s why you should always listen to music on a safe level. The phone of an average user is stuffed with loads of modern hits. Therefore, when testing the new pair of earbuds, most customers choose the first song on their playlist. However, it isn't likely to be much of a help for reflecting the real quality of the earbuds. A lot of studies prove that most modern songs (not all of them) have their frequencies compressed. Such an enhancement makes them sound louder. Older songs didn’t come through this procedure due to the lack of technologies, that’s why they will give you access to a wider range of frequencies. 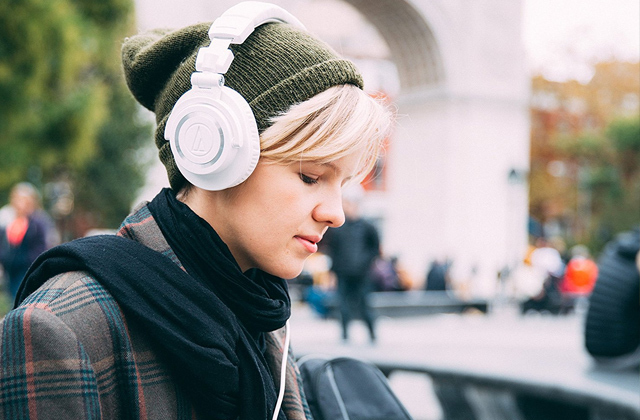 When it comes to headphones and especially earbuds, it might be tricky to find the perfect fit. The structure of your ear is as unique as your fingerprints, that’s why when buying earbuds, stick to those models that come with various additional ear tips. Producing the earpieces for the mass market that will be designed specifically for each user is, of course, impossible. However, there are some companies that create custom-made earpieces. This practice is not really popular yet because it requires a lot of money, time, and effort. Nevertheless, the pickiest users that value their comfort can turn to such companies and get their unique earbuds. It is always good to know something new, especially about those things we use in our daily life. So, we hope this info was useful and interesting to you.